Whether you are a seasoned skier or a relative newbie to winter fun on the mountains, the rules of the game change the moment you transition to arranging the first ski holiday for your family with young children. Suddenly in what should be a very familiar winter holiday scene your first priority is to a set of needs of your children (or partner!) that are unfamiliar requirements. Do not fear! Despite the change of priorities everyone can still have all the fun they need – it just takes a little bit of (more) planning ahead. Read on and let us help you this winter! For those with unending energy there are resorts full of vibrant après ski, boozy evenings and buzzing night clubs. When you have children, the selection criteria may change; the accessibility of ski schools, family friendly accolades (such as Famille Plus Awards) and a variety of activities to keep children’s enthusiasm maintained though-out the week. Very few children enjoy traveling so select a resort you can fly to direct from a nearby airport. A short transfer between the airport and resort also makes a difference when the roads are twisty! When looking at resorts, consider the number of green and blue runs available. There should be a variety of options for the children as well as off-piste and more challenging runs for the adults. The Famille Plus awards are for those resorts that consistently provide family focused skiing – from the ski schools available, children’s menus in the restaurants and dedicated sledging runs. Many resorts offer activities other than skiing. Understandably, some children can’t manage a whole day on the slopes. Alternative activities provide a welcome opportunity to enjoy the snow in other ways. 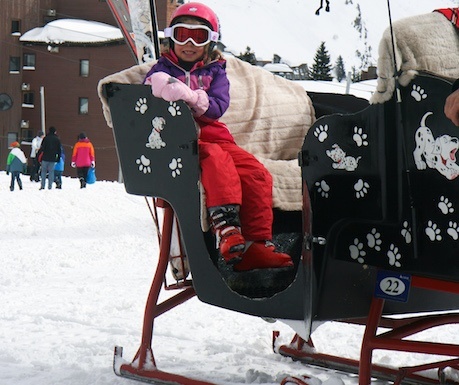 Favourites include sledging runs, ice skating, husky sleighs and horse and carriages rides. The whole family should enjoy the holiday so select a chalet that has the facilities to accommodate both ends of the age range. Hot tubs, saunas, gourmet food and wine for the adults. Early meals, babysitting, large gardens with toys and welcoming staff for the children. Consider if you need sole occupancy or if you prefer to share a chalet with another family. In chalets hosting multiple families you and your children may discover new friends with similar interests. If you prefer your own space, or are already part of a group, then sole occupancy or a chalet hotel may suit you better. One of the worst experiences for any family with young children is walking to ski lifts or fighting your way onto packed ski buses. A chalet within 100m of the slopes or with a dedicated driver to take you to the piste or ski school is ideal (although ski in / ski out chalets can be much more expensive). Don’t underestimate the importance of a washing machine and tumble dryer! Hot chocolate stains, sweaty socks and fetid thermals can all be brought back to life with a quick evening wash and dry. Children grow fast and buying fresh socks and thermals for each day adds to an already expensive holiday experience. Once a child is over the age of 3 they can get on skis and take to the slopes. It can take a while before the strength builds up in their legs but the earlier a child starts, the sooner they will be able to join you on the pistes. Children respond to fun! Many ski schools teach groups with patience, humour and understanding. Select a ski school that offers group lessons so children can be with people their own age, learning at the same speed and having a laugh at the same time. They are on holiday as well as the parents, and you want to make sure they have a good time so they come and ski again next year! Which ski school you choose may depend purely on what is available. However, if you have a choice of ski schools, find out what their ethos is. You may also want to consider your child’s progress through a recognised grading system. 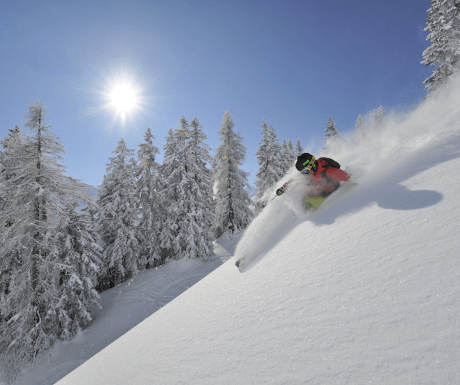 In this case, choose one of the national ski school providers so their level can be easily recognised, irrespective of which resort you visit each year. Adults and children can have different needs on holidays. Be clear what you and your children want from the holiday and be prepared to accept that you might be looking for different things. Many chalets will arrange childcare and the quality of many resort nannies is second to none. Teachers taking some time out and students on gap years offer fun, engaging and flexible childcare. Great childcare like this enables parents to have uninterrupted days exploring the mountains while children are happily making snowmen and sledging. Alternatively, nannies will collect children from ski school and bring them to an accessible mountain restaurant to meet up for some quality family time. Always check the experience and qualifications of any nanny, and make sure they are flexible to adapt to the changing needs of your family over the week. If you dream of fun family ski holidays in the future then children need to enjoy the experience and want to come back again! No-one likes to be cold so invest in quality kit to keep children warm and make sure boots are as comfortable as possible. A spare set of gloves are a must for any child that enjoys playing with the snow as well as skiing on it! Towards the end of the day have some fun games up your sleeve to get them down that last run – the ‘stop’ and ‘go’ game, races against parents (with parents letting the children win!) and seeing if they can reach downhill points on the slope within a given amount of time. These can keep thoughts of cold and tiredness away for a critical half hour or more. Five year olds will not be as strong or have the same stamina as ten year olds so you need to know when to stop. This could be a rest with a handful of raisins, a hot chocolate stop or finishing early to do another activity. Family skiing is the perfect holiday with fresh air, amazing scenery and plenty of fun and adventure. Just make sure to convince the kids so you can go again next year! Great tips on what to look for. Do you have some family friendly ski resorts that fits your recommendation in Europe? I like that you talked about how you must consider choosing a resort that offers buzzing nightclubs that you can visit at night. My husband and I both love to ski, so we’re looking to do some ski activities on our anniversary. It’s important for us to choose a resort which can allow us to enjoy the entire place even at night. It will make sense for us to find a resort that has nightclubs that we can visit. My husband and I will make sure to consider all your tips.